Auguste Rodin (1889- ?) ; André Gide collection; Vente André Gide, Me Lieury, Cuverville en Caux, 12 octobre 1963; André Bercowitz collection. Georges Porto-Riche; Jacques-Émile Blanche, Jane Roberts, Gourcuff Gradenigo, Montreuil, 2012, p. 83; A pastel of Georges de Porto-Riche, executed circa 1889, can be found in an album of paintings by Jacques-Emile Blanche, published by Blanche himself, in volume I, folio 48; To be included in the catalogue raisonné de l'oeuvre de Jacques-Émile Blanche in preparation by Jane Roberts, as no. 1290. During the summer of 1889, Jacques-Émile Blanche painted several portraits of George Porto-Riche, who visited him in Dieppe. Jane Roberts tells us that Blanche wrote: ‘If and when my father could at last get away from Paris and take a couple of days holiday, as soon as his top hat and frock coat were spotted, we were awash with visitors.. Alexandre Dumas in his reefer jacket, Porto-Riche, Carpeaux, Antoine Vollon.. Charles Ephrussi.. and sometimes Claude Monet.’ She continues: 'In Dieppe, summers came and went but never varied, and that was what particularly pleased Blanche: he enjoyed the crowded beach, the jostling hordes of holidaymakers at the fish market or in the harbour. Every July and August, the "chalets" at the Bas Fort Blanc were bursting at the seams with all sorts of distinguished guests. When there was no longer any room in the different houses, overflow guests spilled out into the swish Royal Hotel (which Sickert often painted without ever having been able to afford to stay there). At the other end of the scale, artist friends who didn't have the considerable means of the Blanche family stayed in modest guesthouses and rented flats in the little seaside town. After an afternoon on the beach or at the races, everyone met up on the terrace of the Café des Tribunaux for a well-deserved aperitif and endless discussions'. (Jane Roberts, Jacques-Émile Blanche, Paris 2012, p. 83) Georges de Porto-Riche was a French dramatist and novelist, who by the age of twenty had his plays, in verse, running at Parisian theatres. By 1898 Porto-Riche published Théâtre d'amour, which contained four of his most celebrated pieces: La Chance de Françoise, L'Infidèle, Amoureuse, and Le Passé; they demonstrated Porto-Riche’s focused on human emotions and the psychological in his dramas, which contrasted to the political or sociological preoccupations of many of his contemporaries. Even in Les Malefilâtres (1904), whose characters are working class, love remains the central focus. Porto-Riche was elected to the 6th seat of the Académie française in 1923. However, he was never officially received to the Académie, because the reading committee found the eulogy he wrote for his predecessor unsatisfactory, and he refused to rewrite it. Porto-Riche was also named a Grand officier in the Légion d'honneur. ‘Varengeville, Varengeville! The beautiful place to recite beautiful verse, to hear music... for loving’ wrote Blanche in October 1930 in an article devoted to the playwright Georges de Porto Riche and the cemetery where he was newly buried. Blanche's talents as a painter of still life, portraits, landscapes beach scenes and the occasional incident from everyday life, earned him considerable wealth and a prominent place in the art world of his day. His friends and social acquaintance ranged from the avant-garde to the upper bourgeoisie and he moved with ease from one group to the other. 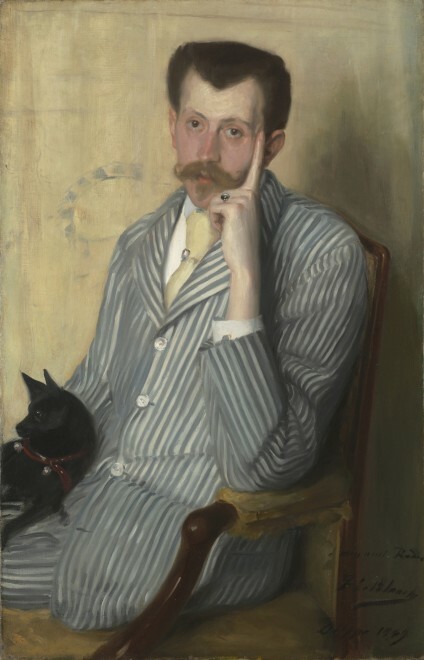 His many portraits are evidence of the range of his connections and the broad recognition of his talent; sitters included Mary Cassat (1885, Seligman Collection), the celebrated writer Stéphane Mallarmé (1889), the pianist Léontine Bordes-Pène (1889-90), the Irish humorist George Moore (ca 1890), the English writer-painter Aubrey Beardsley, and Rodin (1904) to whom the painting here is inscribed. The connection with Rodin was cemented by the extraordinary portrait of the sculptor towering above his desk, with his powerful hands resting on a book. Rodin and Blanche were very different personalities, the sculptor having no interest in the social whirl that the young painter enjoyed but Blanche hugely admired Rodin and the latter was generous in his advice and support. Others in the artist’s circle included Walter Sickert (who joined him in Dieppe), the young Jean Cocteau, whom he painted on several occasions, André Gide (who owned the present painting) and James Joyce (1935). While his art could not be described as progressive, he was nonetheless an open-minded supporter of new talent and critic of moribund academicism. His own origins were respectable and bourgeois, he was the son of a famous alieniste, and his training conventional. He had studied with Gervex and spent time in the more advanced studios of Manet and Degas. His early portraits recall the contemporary style of Tissot and Sargent, although his later painting style owed more to his early 20th century French contemporaries than these artists. A regular participant at the Salon from 1890, he also frequently exhibited in London at the Leicester Galleries and was given a monographic show at the London National Gallery, a rare distinction for a living painter. The artwork described above is subject to changes in availability and price without prior notice. Where applicable ARR will be added.